If you're going to buy gifts this season, why not support the arts? Russell Howze encourages people to expand their idea of art. Mr. Howze, of San Francisco, will visit Rock Point Books this Saturday to discuss his book, “Stencil Nation: Graffiti, Community and Art,” a photographic collection of stencil work done by an international collection of artists. Center for the Study of Political Graphics and Fowler Museum at UCLA Invite you to the closing tour of La Tinta Grita-The Ink Shouts: The Art of Social Resistance in Oaxaca by Jesus Kobe, Oaxacan artist and activist in the 2006 social movement. Yes, we, like everyone else, are in Miami this week friends, and we want to invite you to come say hello in person if you have never before. We arent hosting any shindigs this year, but we are official media sponsors for Vanguard, Gen Art's new contemporary art fair. 149 S. Daniel Morgan Ave.
San Francisco author Russell Howze has found spray paint salvation on Berlin’s Reichstag and on the side of a Clemson apartment building. Launching his Web site, www.stencilarchive.org in 2002, Howze is a noted curator of stencils, a sub-genre of graffiti which utilizes stencils to produce poignant (and expedient) imagery. 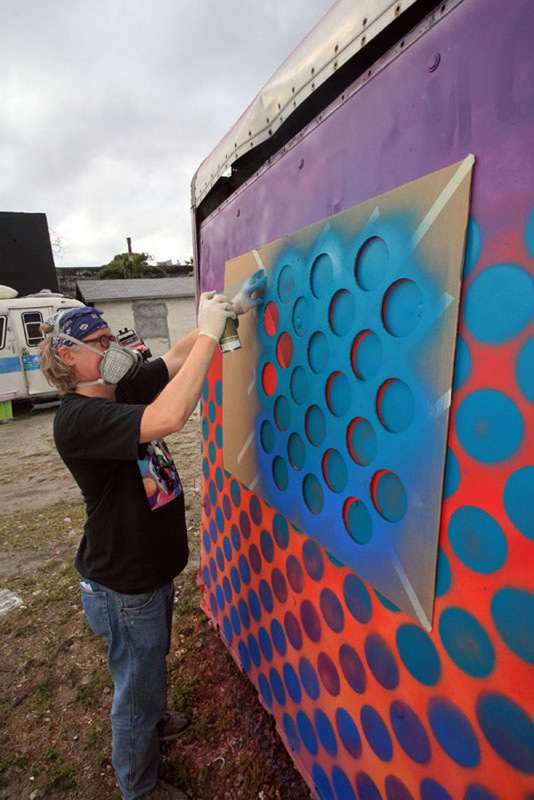 His 192-page ode to the form, “Stencil Nation” was published in June. The tome boasts more than 500 full-color photos of works from more than 350 artists hailing from 28 nations. A second printing is already in the works. After months being down, and hard work Stencil Revolution is back on our feet. We have set up a multiple server architecture to ensure stability of our systems. This means, local, and remote back ups are done daily, and full site back ups are performed weekly. We won't be going down again, and we won't be taking anymore down time. We'd simply like to let everyone know we're back up, and we're looking for our members to come back and contribute once again to our site. We have THE LARGEST stencil gallery on the internet, and it continues to grow by the day. The forums team is looking for candidates to act as moderators, and global administrators. If you're interested please pm Menekali. We're also looking to set up contests, give a ways, and auctions both for SR, and for private members as well. An auctioneer system is in the works at the moment. The tutorials section is days from being finished, and the infamous, .EPS exchange is in it's final stages of development as well. We're also looking for artists to interview, and are in discussions with JSLV Skateboards for a potential user gallery viewing in Los Angeles California. When the time comes, users will be encouraged to enter their pieces, and eventually have them sent to us, where they can be auctioned off at the gallery, and the proceeds given back to the artist. Get the word out. You can beat us up, but you can't keep us down.